Cross-browser testing tool for Web designers. Is there a better alternative to Alkaline? Is Alkaline really the best app in HTML category? Will Alkaline work good on macOS 10.13.4? Alkaline is a cross-browser testing tool for Web designers, letting them painlessly test their website designs on 17 different Windows browsers in seconds. 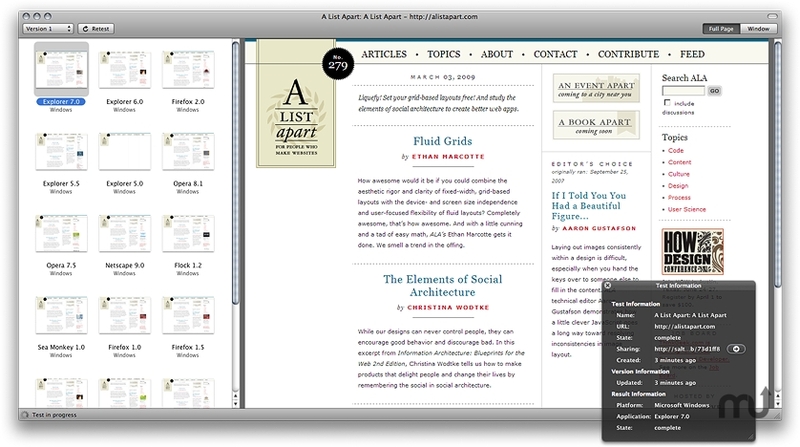 Mac-based Web designers are now able to cross-browser test their website designs on Windows Web browsers without leaving OS X. No installation of Windows is required, nor any other additional software. Alkaline also integrates tightly with Panic's Coda, and Macromate's TextMate, allowing for instant cross-browser website testing from right inside these popular coding tools. Essential update: Uses our new Litmus.com domain name for compatibility. Alkaline needs a rating. Be the first to rate this app and get the discussion started!